Do YOU have a Calico, per chance? On PEACHES & PAPRIKA'S FACEBOOK PAGE we are hosting an informal event to honor Calicos! 3) leave a few words about your cat. If you have xmas pictures, great, but not necessary. After jan 1 I'll do a calico album. Or slideshow if I have any energy left after the last one. We'll follow that in future months with events for all cats - orange, black, tortoise, white, the works!~ But for now if you happen to have a calico and would like to post his/her picture we'd be delighted to honor her. 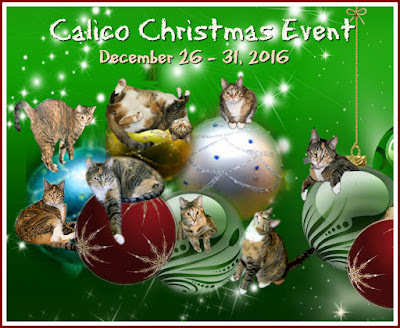 Peaches & Paprika's Facebook Page- the calico event is pinned to the top this week. Sounds like a pawsome idea! This sounds like a lot of fun! Neither of my kitties are calicos, but Dexter's mother is a calico. He has a slightly yellow base color, does that count? MOL I look forward to seeing all of the beautiful calicos that you bring together. I am going right over there STAT! Lucy would love to be a part of this event! Wa-hoo! I don't have a calico but I love them. Happy New Year!